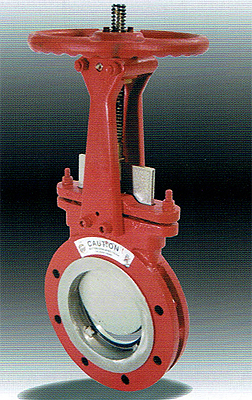 The Red Valve Series G Knife Gate Valve features a cast iron body with stainless steel wetted parts. This efficient valve design affords the user a high-quality valve in which all the wetted parts, including the gate, seat, packing gland and flange face are stainless steel while providing cost savings with cast iron flanges. The Series G has a double-lead ACME thread that reduces operating torque. A special ring-shaped, multilayer packing gland is combined with elastomer to ensure a tight seal. The gate corners are machined with chamfered edges so that the corners of the gate do not wear the packing. The chamfered edge and elastomer seal packing gland prevent packing wear. These valves are manufactured to handle a wide variety of fluids in chemical plants, pulp and paper mills, wastewater treatment plants, mining operations, sugar mills and food-processing facilities. Series G Knife Gate Valves can be fitted with a variety of actuators, including standard handwheel, bevel gear, pneumatic actuators, hydraulic actuators, electric actuators and chainwheel actuators. Other options include limit switches, solenoid valves and bonnets. Stock delivery sizes 2" - 24"